Arnold Palmer passed away on Sunday, September 25. While he may no longer be physically here, he left behind a legacy that will endure for the ages. He was a great man, the undeniable King. There were so many things that stood Mr. Palmer apart from most people. One word does not do him justice but several come readily to mind: swashbuckler, groundbreaker, pioneer, everyman’s man (I know that’s two words, but sometimes one just doesn’t get it done), hero, golfer, kind, generous, loyal, historian and historic both. Mr. Palmer had all of these gifts and more but what set him apart from anyone else was his connection with a massive army of everyday, regular people. The love and devotion that he could imbue with a five minute conversation with a stranger. 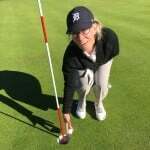 In the past two weeks there have been an outpouring of stories about people’s personal experiences like that with Mr. Palmer. This is mine. 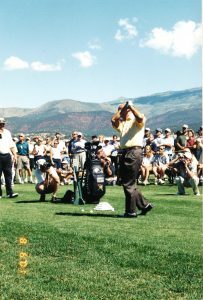 In the early spring of 2001, a few members of the Colorado Section PGA Board of Directors and I were putting together the inaugural, Colorado Section PGA Teach-A-Thon. 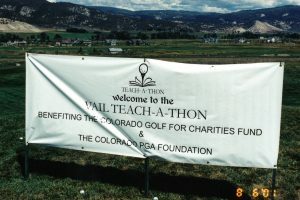 The Teach-A-Thon was a full day of free golf lessons to be given by a group of Colorado professionals to benefit the Colorado Golf for Charities Fund. While we had much of the proposed event planned, we were sorely in need of a marquee name to help us kick-off the event. Our Executive Director, Scott Wellington, had contacted a slew of candidates without any luck. 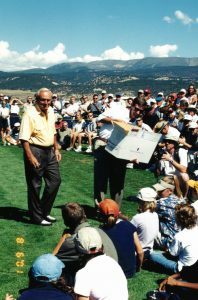 One day as we were discussing the event, someone mentioned that Arnold Palmer was going to be appearing in Vail in August to open the new course that he had designed, the Eagle Ranch GC, and perhaps we could approach him? It was a long shot, but what can you lose by asking? 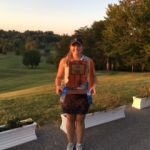 Scott called Mr. Palmer’s office and spoke to Doc Griffin, Mr. Palmer’s lifelong friend and business manager, who told Scott that he would discuss the idea with Mr. Palmer and get back to us. 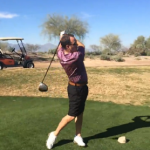 A few days later, Mr. Griffin called Scott and said that Mr. Palmer would be delighted to put his name to the Teach-A-Thon and help us launch our event. 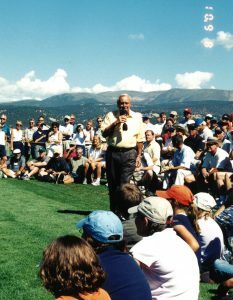 On the 5th of August, Mr. Palmer arrived at Vail airport a little after 8 in the morning. He had flown his own plane in from his home in Latrobe, PA, for most of the evening. He was also only a few months removed from having colon cancer and subsequently defeating that. He was 71 years old, but looked 40. Loved by old and young alike. 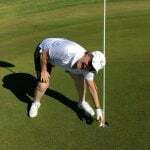 That same classic Palmer finish. When you shook hands with Mr. Palmer your own hand would disappear in his massive paw and his grip was steeled. “I’ve heard a lot about you Jay and the good things you guys are doing and it is a pleasure to meet you” he said. I was immediately cast in his spell. I have never been too terribly impressed with famous people and have never been awe-stuck in the company of icons, stars or princes. I have however, idolized two men and have always hoped to emulate them in some small capacity. One man, I knew for 34 years; my Father. I never walked into a room in which he was in, in my life, that I didn’t kiss him. Never once left our house without saying: “I love you” and not a day has gone by in the 20 years since he passed, that I haven’t thought about him. The other man I spent one morning with; Mr. Palmer. In those few hours I was witness to what greatness is. How he cast a spell on a crowd of people and the joy that he gave each and every person that he came into contact with, was a pure and perfect magic. For so many public people, there is a facade that they show the public and usually a very different private persona. Not so with Mr. Palmer who was exactly the person and man that you knew from a lifetime of watching him. 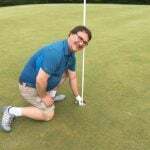 Mr. Palmer was obviously impressed with our Executive Director, Scott Wellington. Four years later he asked Scott to be the Executive Director of his PGA Tour event at Bay Hill (now known as the Arnold Palmer Invitational), where Scott would be for 12 years. I cried when I heard the news of his passing 2 weeks ago, and have had tears fill my eyes while smiling, at different moments since then. The tears are for the man who is no longer with us, but the smiles celebrate what was, an eternal Life. The King is gone but his Army marches on. They are millions in their number and they march in awe, as one.